Tunnistautumistapa Ellibs-palveluun on muuttunut. Palveluun ei kirjauduta enää Ellibsiin luoduilla erillisillä tunnuksilla vaan Haka-tunnuksilla eli Itä-Suomen yliopiston käyttäjätunnuksella ja salasanalla. The Ellibs service’s authentification method has changed. Instead of separately created login credentials, you use your HakaLogin-credentials, in other words, your UEF username and password. Kun klikkaat “Kirjaudu sisään”, ruutu näyttää nyt tältä. Hyväksy tietojesi tallentaminen ja käsittely Ellibs Libraryssa, mikäli haluat käyttää palvelua. When you click “Log in”, the login screen looks like in the picture above. 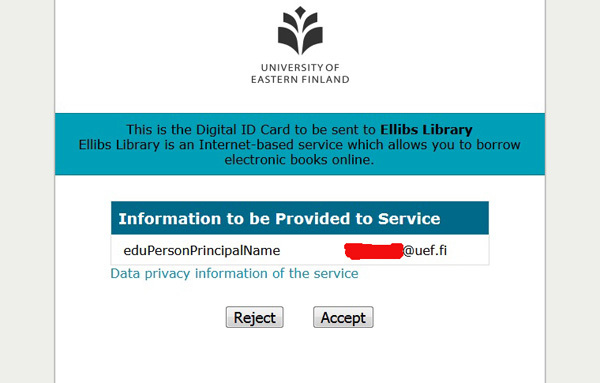 Check the box “I accept the storage and management of my personal information in Ellibs Library” in order to use the service. Mikäli kirjaudut palveluun uudella laitteella tai selaimella, sinun on tehtävä tunnistautuminen. Valitse kotiorganisaatioksesi Itä-Suomen yliopisto, ellei se näy oletusvalintana. If you are logging in to the service using a new device or browser, authentication is required. 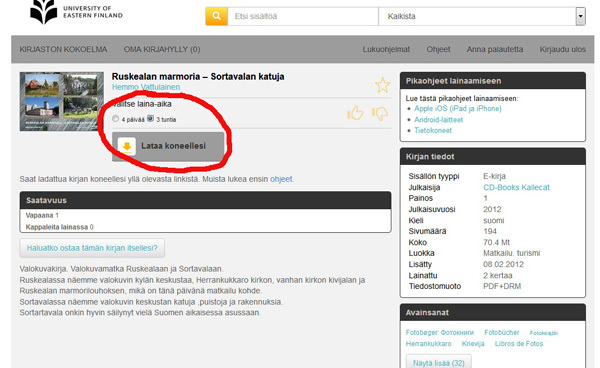 Select University of Eastern Finland as your home organisation, if it is not shown as the default choice. 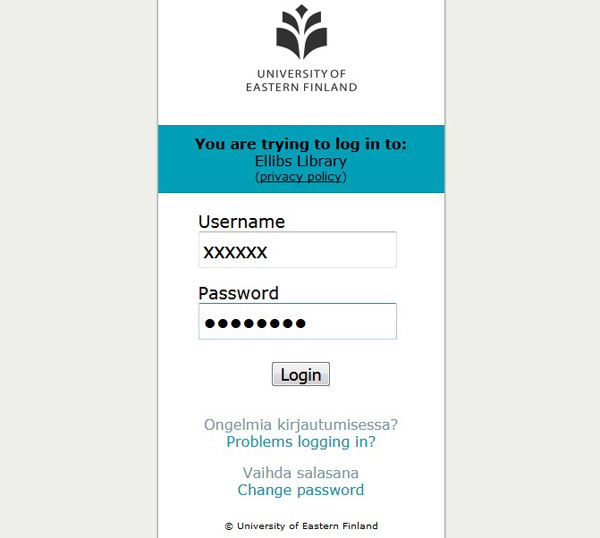 Enter your UEF username and password. Hyväksy tunnustesi siirtäminen palveluun (Accept). In order to proceed, accept sending your credentials to the service. Tämän jälkeen ohjaudut takaisin Ellibsiin. Valitse haluamasi laina-aika ja klikkaa “Lataa koneellesi”. After the authentication, you are directed back to Ellibs. Choose a desired loan time and click “Download”. Valitse kirjatiedoston avaaminen Adobe Digital Editions -ohjelmalla. (Jos oheisenlainen ikkuna ei avaudu, aloita alusta ja kokeile kirjan lataamista uudelleen.) Mobiililaitteessa tiedosto avautuu Bluefire Reader -ohjelmaan. Choose to open the book file with Adobe Digital Editions software. 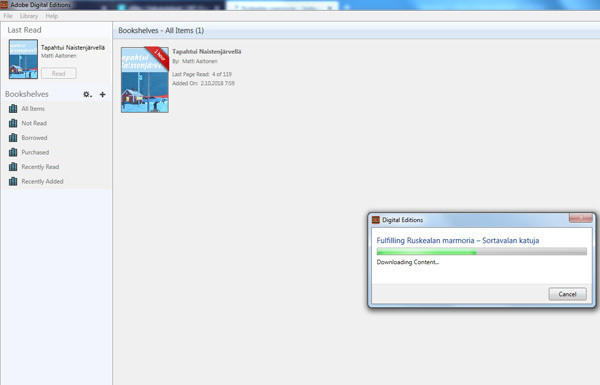 (If a window as shown above does not pop up, start over from the beginning and try to download the book again.) When using a mobile device, the file will open with the Bluefire Reader application. Kirja latautuu lukuohjelmaan. Taustalla näkyy aiemmin lainattu kirja. 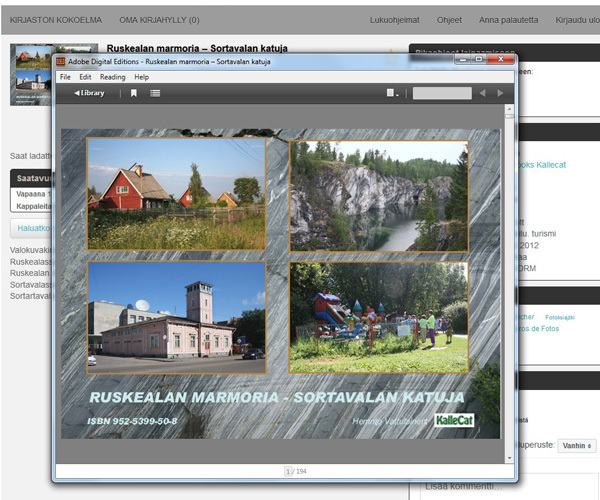 Above is how the book is loaded into the reader software. You can see a previously borrowed book in the background. Kirja on latautunut ja luettavissa. Now the book has been loaded and is readable. Miten löydän kirjaston uudet aineistot UEF-Finnasta? 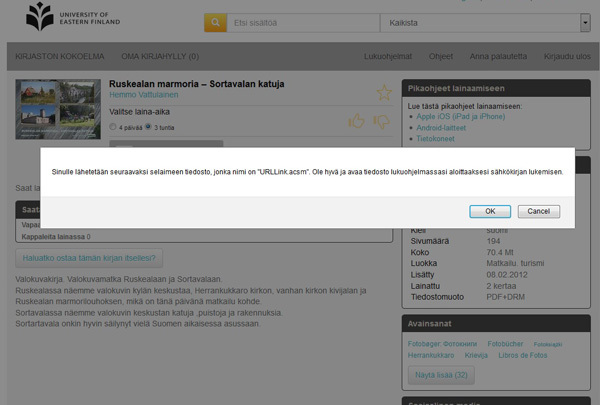 | How to find library’s new material in UEF Finna?